The Kunstkammer (translating from German — «chambers of curiosities») was founded in 1718. The building was designed by the architect G. Mattarnovi. It was meant for the library and the collections of «monsters and rarities» gathered by Peter I. The architect S. Tchevakinsky was the one to restore the Kunstkammer, but the new building did not feature the upper circle of the tower. This part of the building was restored only after World War II by architect R. Kaplan-Ingel. The Kunstkammer features a very favorable location. 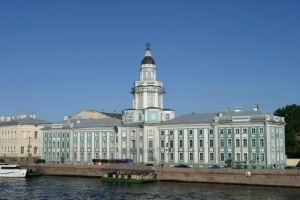 Situated on the bank of the Neva River, the building could be seen from far distances. M. Lomonosov explained that Peter the Great wanted people to see the Kunstkammer building and think of the importance of sciences. Since the Kunstkammer belonged to the Academy of Sciences, this explanation sounds like a very realistic one. In 1727 the collections of Peter the Great were transmitted from the house of the disgraced grandee Kikin to the Kunstkammer. Since then the first Russian museum was always full of visitors. Until the end of the 18th century the building of the Kunstkammer housed some departments of the Academy of Sciences founded by Peter the Great. Nowadays the Kunstkammer contains the collections of Peter the Great's Museum of Anthropology and Ethnography based on the gatherings of Saint Petersburg's founder. Soon after the end of World War II the museum of M. Lomonosov was opened in the Kunskammer. The great Russian scientist worked in the building for over a quarter of the century. The exposition of the museum is dedicated to the Academy of Sciences development and Lomonosov's contribution to Russian science. The visitors to the museum can see original documents and objects of Lomonosov's time, including scientific tools, books, portraits, prints, some of which used to belong to Lomonosov himself. For three centuries since the museum's foundation the collection of the Kunstkammer has been constantly growing. Many famous travelers made outstanding contributions to the enlarging of the museum collection. D. Cook, I. Kruzenshtern, Y. Lisnyansky, F. Bellinsgausen, N. Mikluho-Maklay and others brought from their oversea travels real treasures. Nowadays there are several permanent exhibitions devoted to the ethnography of the peoples of Africa, America, China, Japan, Indonesia, Australia, Oceania and other countries, and the exhibition Anatomical Rarities of the Kunstkammer. At the ethnographic exhibitions the visitors can see models of religious and dwelling houses from the different ethnographic regions of the earth, traditional clothes, instruments of labor, domestic utensils, ceramics, decorated glass objects, artistic metal works, including objects of precious metals, musical instruments, religious objects, ritual accessories, sets of traditional weapons, and so on. One of the most famous exhibits of the Kunstkammer is the unique Globe-Planetarium of Gottorp. It was created in Germany in the 17th century and during the Northern War was presented to Peter the Great who brought it to Saint Petersburg. The diameter of the globe is 3,1 meters. Outside the Globe all known by that time continents, seas and rivers were pictured and inside there was the first planetarium in the world. 89 Nevsky Pr. / 4 Goncharnaya St.